Indulging in sweet treats is a Valentine’s Day tradition, but for kids with diabetes, overindulging can have serious side effects. Start a new tradition. Go on a fun outing together or give your child a Valentine-shaped coupon to redeem for a favorite activity. 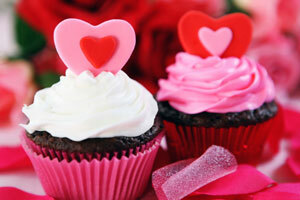 Look for low-carb versions of Valentine’s Day goodies, which will have less impact on your child’s blood sugar levels. Find a healthy substitution with a sweet treat recipe that’s diabetes-friendly. Instead of candy, send your child to parties with heart-themed stickers, pencils, erasers and other small items. If your child receives candy at a party, allow her to enjoy some as a treat but be sure to count the carbs and adjust your child’s meal plan and insulin, if necessary. Save some of the candy in a low-blood-sugar stash just for your child or help him learn to pay-it-forward by sharing with favorite family and friends. Trade large candy bars for fun-sized treats. Just be sure to check the labels and buy lower-sugar brands. Buy or trade your child’s candy for non-edible treats or gifts, such as books, small toys or even cash. Be aware of your child’s blood glucose levels often to account for changes in daily activities and diet. Talk to your child’s teacher to see if candy is allowed at school parties and make sure the school knows how to handle the situation. Talk to your child about what to do when sweets are offered at school and be sure she knows how to get help. For more information about diabetes, visit akronchildrens.org/diabetes.